Explore curriculum developed for grades 3-5 focusing on Dali Museum Collection. Explore curriculum developed for grades 3-5 focusing on Dalinian Mathematics. Explore curriculum developed for grades 3-5 focusing on Dali and Science. Downloadable Word document to use when creating your Dalinian integrated lesson and unit plans. Explore curriculum developed for grades 6-8 focusing on Dali Museum Collection. Explore curriculum developed for grades 6-8 focusing on Dali Dalinian Mathematics. Explore curriculum developed for grades 6-8 focusing on Dali and Science. Explore curriculum developed for grades 6-8 focusing on Dali and more. Explore curriculum developed for grades 9-12 focusing on Dali Museum Collection, Paintings and Sculpture. Explore curriculum developed for grades 9-12 focusing on Dalinian Mathematics. Explore curriculum developed for grades 9-12 focusing on Dali and Science. Downloadable PDF of key images to use in your classroom. Downloadable PDF of script to our free public audio guided tours for adults. Downloadable PDF of German script to our free public audio guided tours for adults. Downloadable PDF of Spanish script to our free public audio guided tours for adults. Downloadable guide which includes painting descriptions of key works from the collection, a biography of the artist and Dali Museum information as well as a resource list, educational opportunities for students and school tour information. The Dali Museum has assembled a number of interdisciplinary lesson plans as a starting point for you and your students. These lesson plans currently address FCAT, Sunshine State Standards, and Florida Writes. Welcome to Destination Dali Museum, here is the downloadable The Teacher’s Lounge (PDF). “The Teacher’s Lounge” is designed to introduce educators to Salvador Dali and the Dali Museum. Featuring an in-depth examination of the six paintings that form the basis of the museum’s “core” lesson plans, this introduction also includes a short biography of the artist, a brief discussion of the challenges and rewards of teaching Dali’s work, and a short history of the museum. After watching the museum’s Get Surreal with Salvador Dali video, students express their own reactions to several of Dali’s paintings, they ask questions of the works at hand, and they compare their responses to other responses in class. For homework, students create a piece of writing or artwork that responds in some way with one of the paintings they’ve encountered. After watching the museum’s Get Surreal with Salvador Dali video, students use maps to begin placing the artist in very specific historical and cultural contexts. They read an essay on Catalonia and Spanish cultures and then, for homework, are asked to identify similarities between their own cultures and the cultures they encountered in class. Students are introduced to some art-historical terms and identify examples of Impressionism, Cubism, Surrealism, and Classicism in Dali’s art. Then, focusing on Surrealism, students learn about Surrealist techniques by experimenting with games like Exquisite Corpse, automatic writing or automatic drawing. For homework, they are asked to assess Surrealism and to write about why it might be important. By examining Dali’s work and by making their own pieces of art, students become familiar with and then discuss the Surrealist technique of collage. Students have a chance to reflect on their museum visit and begin exploring their own personal art aesthetic. They read an essay which uses Dali’s work to discuss what people might value in art and are then asked to write about their own favorite piece from the museum’s collection. Students explore the impact of culture on artistic production by trying to locate where culture “happens” and by learning about aspects of Dali’s Catalan and Spanish cultures. They return to the collages they made in Lesson Three and speculate about how their own cultures are visible in the works they produced. In this unique collaboration between the Salvador Dali Museum and The Pier Aquarium, Inc., students plan a version of the Surrealist art game “The Exquisite Corpse” in order to create “Exquisite Sea Creatures.” Then, using their creatures as “specimens,” students practice scientific observation, gain and understanding of how marine creatures adapt to their environments, and learn how to write a natural history. In this lesson plan for 3rd or 4th year Spanish classes, students work in small groups to translate Federico García Lorca’s poem “Ode to Salvador Dali.” Then they explore the poem and discuss the issues they faced when translating. Using Dali and Velázquez, bullfighting, and the Dali Mueum gift shop as occasions to learn and practice specific Spanish language skills, these little lessons for Spanish language students of all levels will leave you wanting uno mas. 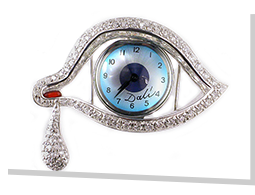 Ever since The Persistence of Memory hit American shores in 1931, the soft or “melting” watch has been nearly synonymous with Salvador Dali’s name. The following materials offer a thorough overview of the painting — as well as suggestions for classroom activities — to help satisfy your curiosity as well as your classroom needs. Orwell’s essay about Dali’s obscenities was itself suppressed on charges of obscenity in 1944. Students read and respond to “Benefit of Clergy: Some Notes on Salvador Dali,” discuss issues of censorship, and examine controversial figures in pop culture in light of Orwell’s ideas.